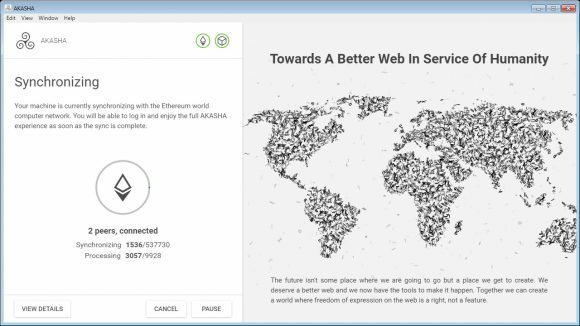 We need to start with the fact that AKASHA does not work in your browser, like the similar in concept project Steem for example, instead you need to download and run an application to get access to the network. There are versions available for Linux, Mac and Windows users available, so all major software platforms are pretty much already covered. If you are interested in giving AKASHA a try you might want to head on to their GitHub page where you can download the latest alpha release. There are two separate versions available for each platform, one with an installed and one that is in a Zip archive that you can extract and run directly. 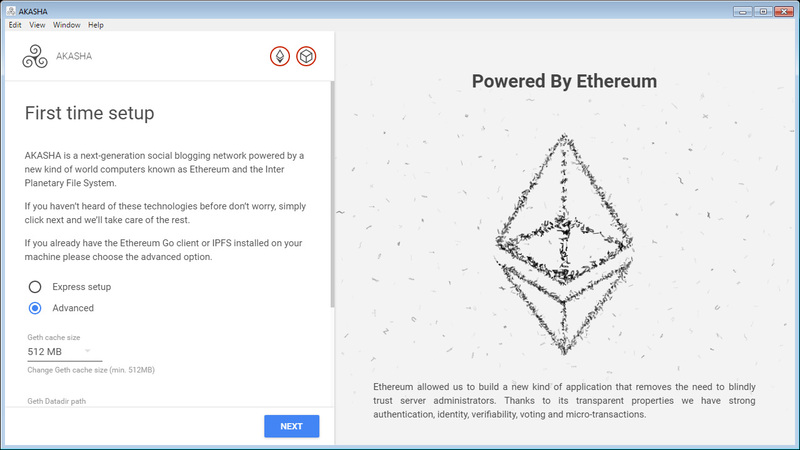 Since AKASHA is based on Ethereum when you first run it and install it you need to wait a bit for it to synchronize, no do not worry it does not need to download the complete Ethereum blockchain from the start or something, though you may still need to wait a couple of minutes while you connect to some peers and get things moving forward. Once you synchronize AKASHA you will need to create a new identity or essentially a profile on the network. 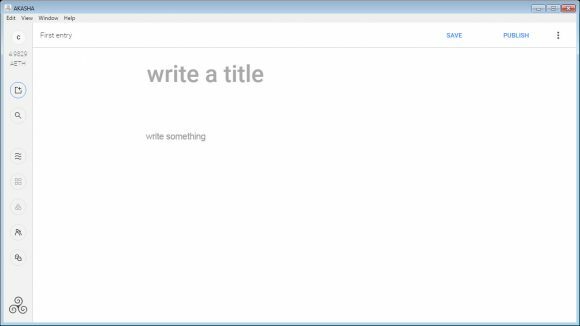 You need to enter a First Name, Akasha ID and a Passphrase as a requirement, the Last Name field is optional and you have some more optional details that you can enter as well is you want to like an short about you or extra links, you can also set an Avatar and a Background image to use. Later on you will be able to edit your Profile details, only the username and password are not available to be changed and there is no password recovery, so make sure you don’t forget your password, even though we are not sure if identities from the Alpha will be available for the launch of the network. 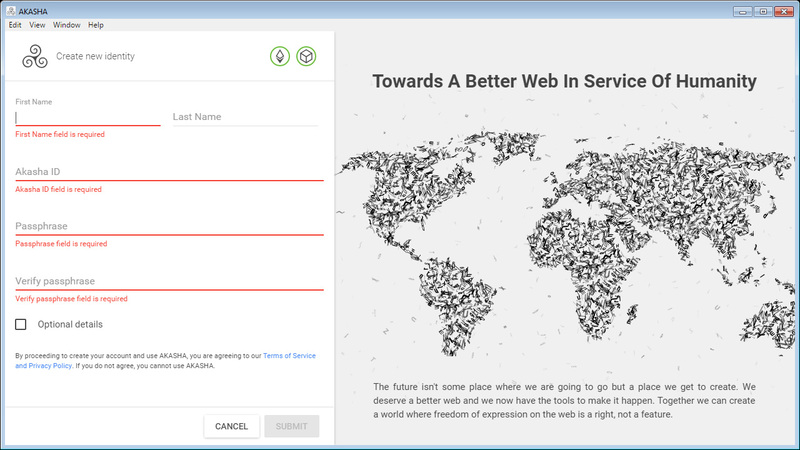 This is the window that welcomes you as soon as you finish with the registration and long in with your profile and is essentially your user interface for accessing the AKASHA network. 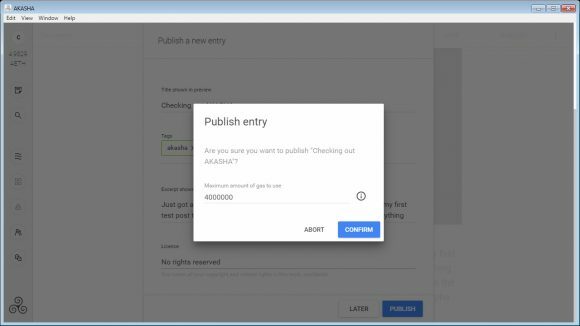 You may need some time and a bit of tinkering to explore the currently available functionality, even though we are going to show you some of the most basic stuff here anyway. Do note that since this is still an Alpha version of the project not all features are available and working and the whole thing is also running on the testnet for the moment. 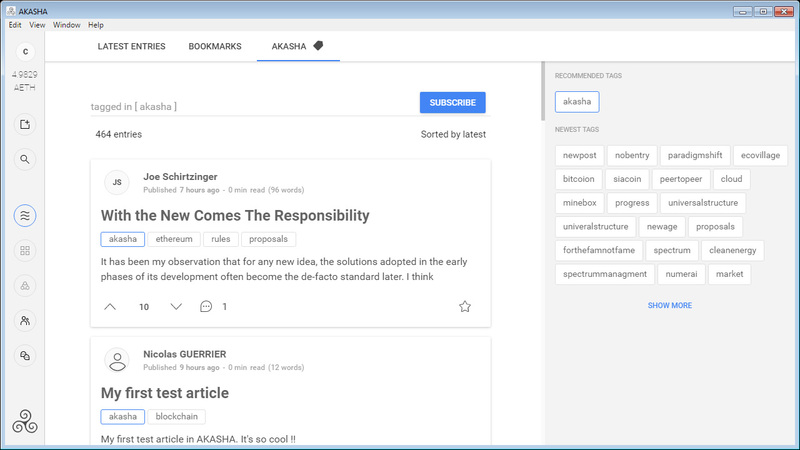 By default you are being shown the latest posts tagged with the akasha tag, if you want to see the latest publications just switch to the Latest Entries. The menu is on the left side, starting with a link to your profile page and a number showing the amount of tokens you have available. 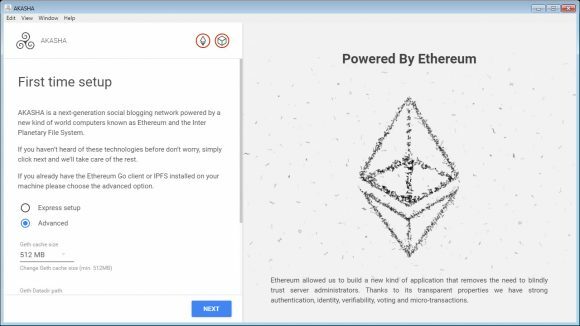 This is another important part of the whole project, it not only runs on the Ethereum blockchain, but also uses Ethereum tokens to reward users that post content on the network. Since it is still in Alpha the project uses AETH or the so called AKASHA ETH tokens instead of actual ETH tokens and you apparently start up with 5 AETH. 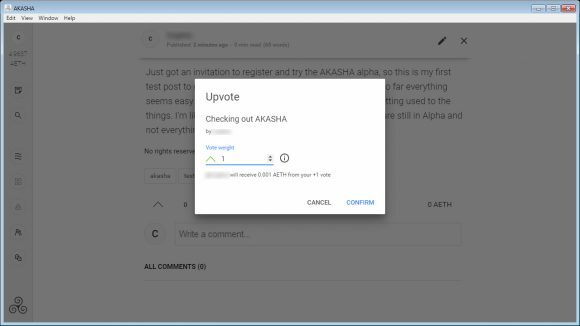 As a test token it does not have any value outside the purpose of testing AKASHA, so feel free to spend it voting for posts while you explore the functionality of social network. Posting content on the AKSAHA social network is one of the key aspects just like with any other social network, as well as reading and voting for content posted by other users of the network. The idea here however is that you get rewarded for your contribution if other users decide to support you with their votes, unlike with traditional social networks where you don’t get rewarded. Posting something is really easy, you start by writing a title of your posts and a content that can be composed of text and images and you can save for later it as a draft or publish it directly. 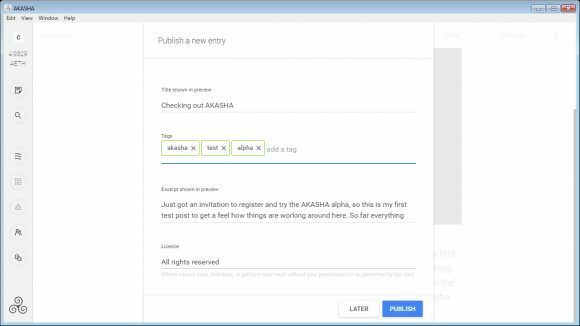 Before your post appears on AKASHA there are a few more details that you need to add some relevant tags to make your post easier to be found for a certain topic that it covers as well as choose a License for the post. Now, here is the interesting part, on AKASHA you get to choose what type of licensing you want for the content you post… it can be All rights reserved, or Some rights reserved as well as No rights reserved where you get to decide if it is under CC or Public Domain license. Retaining copyright over all your posts or some of them or having everything published and available under Creative Commons license, it is all up to you. The idea is that once you publish something it is not like it you waive all copyright over the content by default, you get to decide and that also gets stored along with your post. Do note that actually publishing a post on the network does require you to spend some gas for the transaction on the network, so you will essentially be spending some AETH now to do that (ETH in the future). 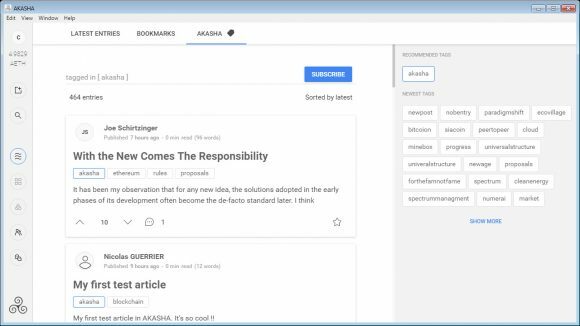 So it is not only earning up, but also spending some tokens to actually use the AKASHA network and “expenses” like these are intended to stimulate users to focus on interesting and useful “good quality” content and not post just about anything they think of. Not sure how many of you actually remember that originally ETH was intended as a crypto token to be spend for executing transactions on the Ethereum network and not to work in the same sense like a more traditional crypto coin such as Bitcoin does for example. When your post is up you can vote for it as other users can also vote for your post. You can of course also vote for other users posts and you get to decide how much your vote will be worth… the more worth the more AETH you will spend and the more the respective users will get. There is also the option not only to Upvote, but also to Downvote content, however once you vote Up or Down you are not able to retract your vote for that post or change your decision. You can browse posts by tags, look at the latest publications, or search for posts (cannot yet search for people on the network). 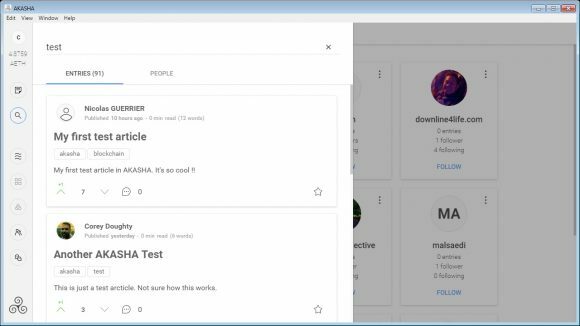 You can browse among the users of the network and look for the ones to Follow or see who is Following you, there is a functionality to just tip users directly as well instead of just giving them votes should you decide that you want to do that. There is even a built-in chat in AKASHA, though at the moment there is just a single official channel for the Alpha release. You can of course create your own channel as well, but it will be available for 24 hours and after that all the messages inside it will disappear. This is pretty much the basic functionality you have available in the current Alpha version of AKASHA, there are more features and functionality on the way as not everything is already implemented. 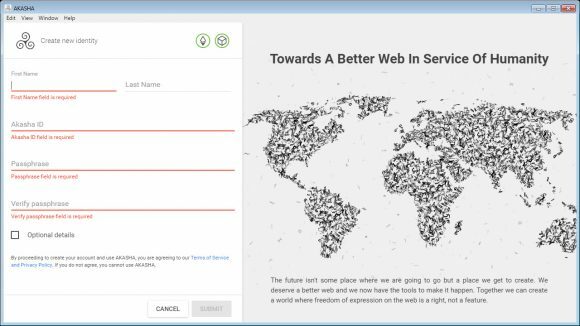 The basic functionality is already there and it works pretty well in our opinion and with some more extra features and improvements this project will have some nice potential. What you will probably notice however is that some things related to posting or reading data may take a bit of time before they finish, this is something that needs some more work is well as nobody likes to wait. 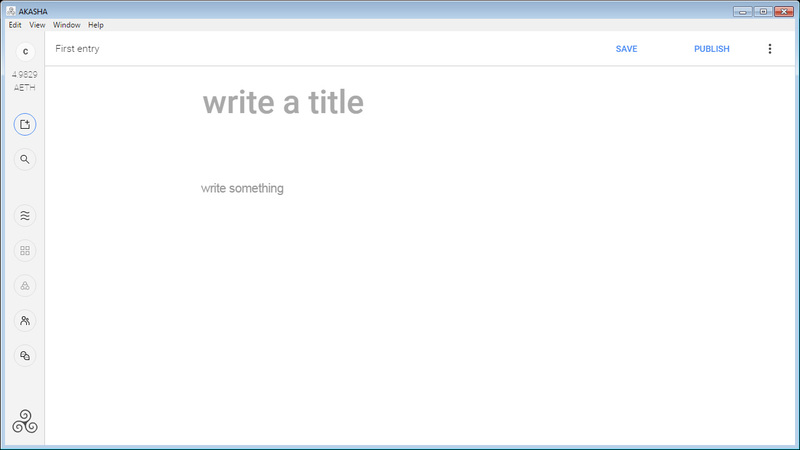 This is an Alpha version of the project and you should remember that should you decide to give it a try at its current state, so things should get better for the final release. The fact that you need to use software that you download and run on your computer to access the AKASHA network might be a bit of inconvenience as compared to other similar projects that you can access directly from your Internet Browser. 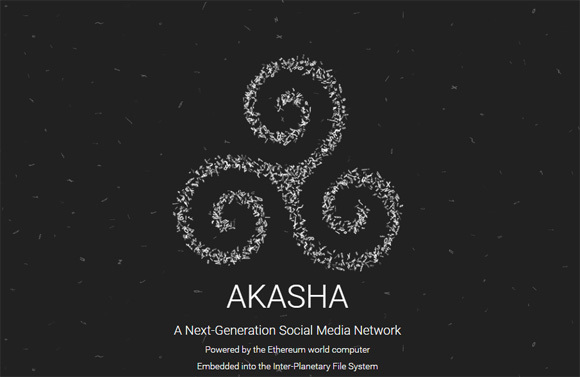 Aside from slower early adoption this should not prove to be such a problem later on if the project catches on and attracts a lot of user attention and one of the most attractive points here are the rewards for the users of the AKASHA network. One more thing that needs addressing at the moment is regarding rewards for users that may not have that great and interesting things to post and get a lot of votes for their content or that actually want to contribute in ways different than posting themselves. Getting rewards for good comments or just for voting for interesting content has shown to work well with other similar projects, but here this is not being rewarded. Attracting users initially is one thing, but keeping them on the long run is completely different and for that to happen you need to engage them in different aspects of contributing and communicating with each other, as well as rewarding them for that, especially when the rewards play a key role in the project’s idea.